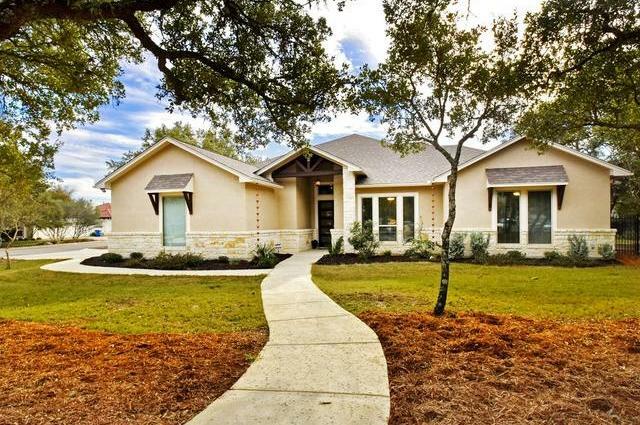 Charming one-story (no steps) hill country home with stone/stucco exterior-only two years old. This home has it all-3 car oversized garage, corner lot, open floorplan, extended back patio w/ outdoor kitchen. Located on one of the highest elevations in Fair Oaks-lot is .69 acres, mature trees, gardening garage & wrought iron fence. Home features high ceilings, large windows, wood floors in dining room, granite throughout, 16' glass slider in family room. Study could be 4th bedroom. Media room (5th bedroom).